So I thought I was a year older, all year I have been saying that I am a year older, so surprise to me that I wasn’t turning 50 this year. I actually had a mini panic attack when I thought I was turning 50, that I should at least have a party or something of the sort. Hubs should really be planning something…then it dawned on me, I started counting back, no I am not 50. So then on to the next MAJOR decision, WHAT KIND OF CAKE would I like, or am I going to make? Some of you may know that I am purely obsessed with Carrot Cake, I think I have pinned over 100 Carrot Cakes on Pinterest! But then I started reading about Joy The Baker’s Gingerbread Cake and it looked like all of my dreams had come true, I think I have found a cake that I love more than carrot cake! I know, it seemed impossible, but it is true! 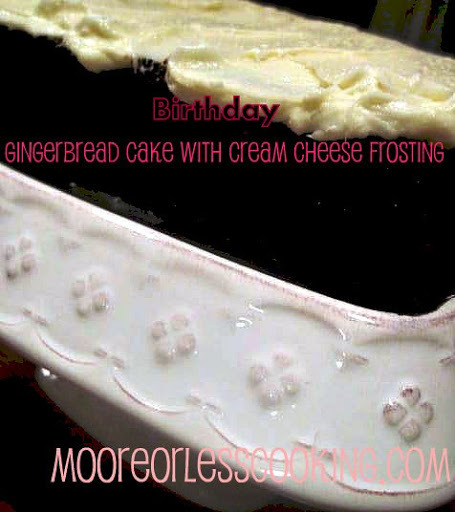 This cake is so moist and perfectly perfect in it’s gingerbready-ness and the cream cheese frosting is so delicious, I had to try 3 tablespoons full to make sure that I didn’t poison my family, it’s the least that I can do to save the poor souls. Place a rack in the upper third of the oven and preheat oven to 350 degrees F. I used a 10-inch square baking pan, Grease the pan. Line with parchment paper ( I wish I had done this part, really helps to get the cake out of the pan.) Grease and flour the parchment paper. Set pan aside. In a large bowl whisk together vegetable oil, sugar, and eggs until thick and pale. Stir in molasses and honey. Add all of the dry ingredients to the wet ingredients. Stir together until incorporated. Add the warm water and gently stir until incorporated and the mixture is smooth. Pour the batter into the prepared pan. If you find that the mixture fills the pan more than three-quarters of the way full, you might consider using a larger pan (a 9 or 10-inch pan may serve your better). I used a 10-inch pan and it worked perfectly. In the bowl of an electric stand mixer fitted with a paddle attachment, blend the cream cheese on medium speed. The cream cheese should be soft and smooth. Stop the mixer. Add the softened butter. Scrape down the sides of the bowl and beat the two together over medium speed until smooth and incorporated. Add one cup of powdered sugar. Blend until incorporated. Add vanilla extract and remaining cup of powdered sugar. Beat on medium high speed until frosting is smooth. Allow cake to cool in the pan for 20 minutes. Remove and allow to cool completely on a wire rack before frosting the cake. Nettie, HAPPY BELATED BIRTHDAY!!! 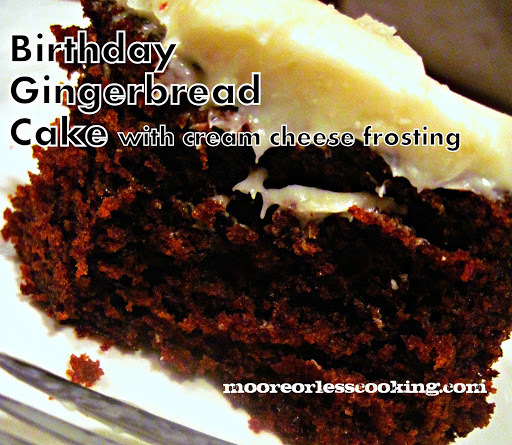 I SO love gingerbread and with a cream cheese frosting?! I dun think I’ve died and gone to heaven!! YUM!! Thank you SO much for sharing this at Wicked Good Wednesdays! Hope we see you again next week! !